When M and I moved into our current home built in 1870, I was ecstatic to have not one, but FIVE fireplaces. Growing up, our mantle was always well decorated, particularly around the holidays (shout out to mom for always having a beautifully decorated home). When I finally got the chance to decorate my own, the creative juices started flowing. First, I took to Pinterest (logically) and found plenty of inspiration for the different rooms in the house. Turn your mantle into an art gallery. 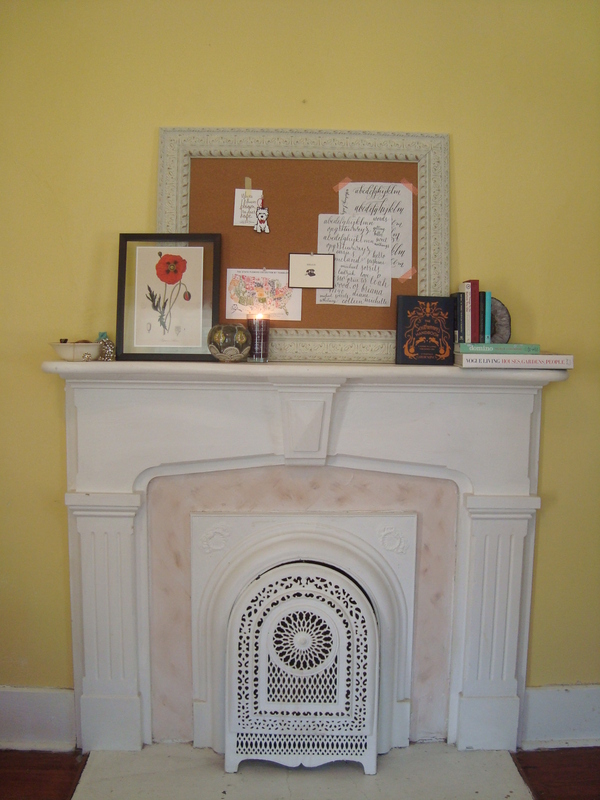 Consider painting your mantle wall an accent color. Sometimes what you put in your fireplace can be even more interesting than what’s on your mantle. Disregard your mothers rules of symmetry and embrace a deconstructed composition. If you’re lucky enough to have a kitchen mantle, consider displaying a menu chalkboard. Sometimes clean, modern lines are all you need for a sleek mantle. 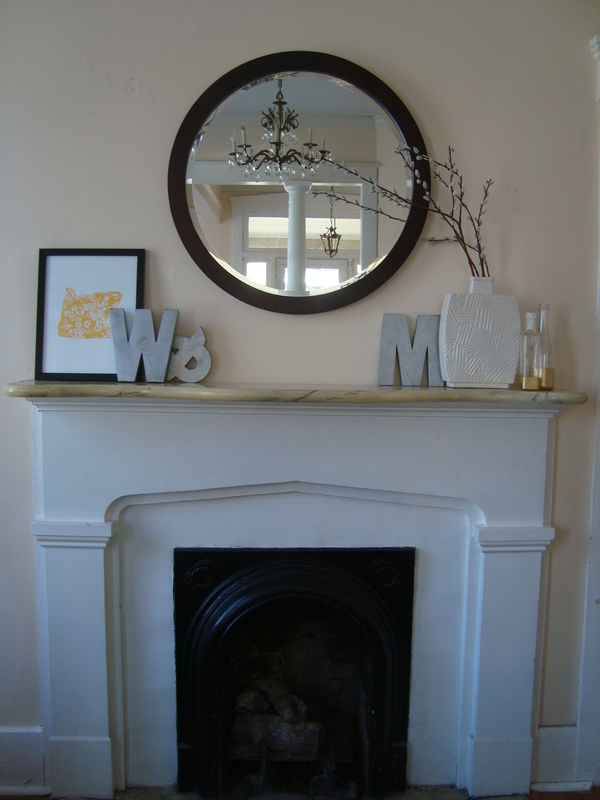 I love the simplicity of this mantle. okay, ignore the screenshot, but notice how the candlesticks and large decanter add height. Fresh flowers, height, this one’s got it all. We love the look of fresh flowers on the mantle. It has us dreaming of spring. Weathered woods, bright mossy green, and bird motifs bring the beauty of nature indoors. Playing with color is encouraged, but sometimes a natural palette is just right. The brainstorming process was not one without frustration. My search resulted in a lot of this (uhhh, thanks for the inspiration…), not mention my budget was not a single penny, so those beautiful, fresh (or faux) flowers would have to wait. In the end, I came up with three styled mantles each tailored to its respective room. I love decorating my home because it’s a constantly evolving process. Once you’ve got the basics (a bed, a sofa, a kitchen table, etc. ), you can add to your collection over the years as you find the perfect pieces. That said, the following mantles are a work in progress so all advice and ideas are welcome. Disclaimer: It’s a rental, paint colors can’t change. Also, I’m not a photographer. Not even an amateur one. You’re lucky these pictures weren’t taken with my cell phone. Finally, I’m not the designer half of this duo, so be nice ;). Our living room mantle is one of the first things you see when you enter the house. The room is often sunny and bright so I tried to mirror that with the decor in the room. I used Merimekko fabric to make pillows for the sofa, so I replicated those bright, cheerful colors on the mantle. Print is from Thimblepress by the talented Kristen Ley out of Jackson, MS; metal letters are from Anthropologie; mirror is from Crate & Barrel; white vase is from T.J. Maxx; I created the gold-dipped smaller vases using old bottles. For the office I used the mantle as a creative space for ever-changing inspiration. The bulletin board (from Hobby Lobby) showcases some extra goodies from Thimblepress and calligraphy practice for the Skillshare class I’m taking from Molly Jacques. Other items include vase from Anthropologie, print from Outtake Illustrations, jewelry bowl from an estate sale, and The Southerner’s Handbook from Garden & Gun. 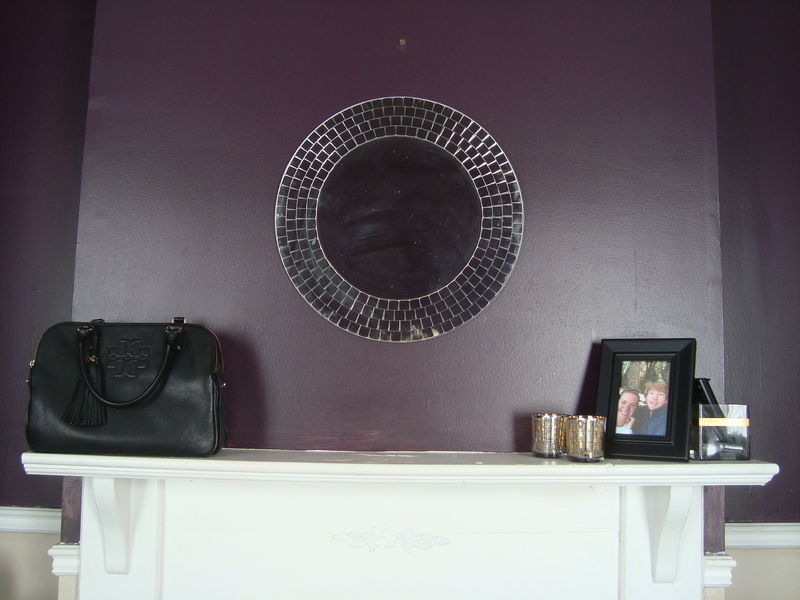 Can we discuss how much I would LOVE to repaint the pink part of this fireplace? It needs to be done. For the bedroom I wanted something a little more simple. Remotes and knick-knacks are collected in the vase on the right, created from a vase purchased at T.J. Maxx and gold stripe added using painters tape and gold Rustoleum Spray Paint. Tealight vases from Crate & Barrel. Mirror from Ikea. I keep a lot of essentials (lip color, moisturizer, etc.) in my purse so it’s nice to have it on hand and accessible in the bedroom. So cool. I am so jealous you live in a house with such character! All of the mantel decorations are beautiful but the Living Room one is my favorite. Are those letters from Anthro? They’ve been on my wish list for ever. I’m in luuuv with the vase in your living room, your office fire place, and those letters.. hhhmmm i need to steal some ideas from here 😉 very beautiful n creative i must say! Thank you, Jovy Rayne! It’s a work in progress as always, but I appreciate the kind words!